You can do it... at home! : Pear Danish - fruits for breakfast, check! Pear has been in full season for few months and I have been having them in many different forms; fresh, poached and baked, in many different dishes; pancake, salad, cakes…and today, with Danish. I love cooking with seasonal produces. Not only that they taste better, they are also more economical and take less food miles to get to my plate. These danishes were made using the croissant dough with natural starter. It can also be made with any croissant/laminated dough of your choice. The pastry was filled with crème patiserrie (pastry crème) and top with poached pears. I roughly followed the recipe from Bourke Street Bakery cookbook. I changed the recipe slightly by using my own poached pear recipe and different croissant dough. It was the first time I made Danish. At first, the shaping was a little challenge. They kept springing back and shrinking. I finally got the hang of it after few tries. These Danishes were heavenly, seriously good. They were moist, buttery and flavoursome. Crème patisserie and poached pears added dimensions and flavours to the pastry. They were perfect for breakfast and/or afternoon tea. It didn’t make us feel so bad to have buttery pastry for breakfast, given that there were some small pieces of fruits on them J. Well, at least, we had fruits for breakfast. Any poached pear recipe would work. The recipe I used is here. Any croissant/laminated dough would work (croissant with pre-ferment, croissant made with poolish, wholewheat croissant, sourdough croissant). I used croissant with natural starter with this recipe. After placing the poached pear on top of crème patisserie, the crème might overflow due to the weight of the pear. Don’t worry, the pastry cream will be cooked (as baked custard) once baked and it’s hardly noticeable. To create a pocket on the Danishes, I pulled/stretched each corners of the square before folding them to meet in the middle. The Danish expanded substantially during the proofing and baking. So, it is advised to leave enough space on the baking tray during proofing. Make the poached pears (cut one pear into 8 pieces), cool, refrigerated. Make crème patisserie (recipe is below), cool, refrigerated. Take the croissant dough (finished with three turns) out of the fridge and roll it into 4-5mm thickness rectangle (approx 30 x 60 cm in size). I usually cut the dough in half as it is easier to roll and more manageable with the limited space of my kitchen bench. Cut the dough into 9-cm squares. Place the squares on trays lined with baking paper and place in the refrigerator for about 10 mins. Remove the square from the fridge and working with one square at a time, fold each corner to meet in the center pressing down firmly to create a smaller square. Arrange the Danishes back onto the lined trays at well-spaced intervals. Place 1 1/2 teaspoons of creme patisserie in the centre of each Danishes and top with two pieces of pear. 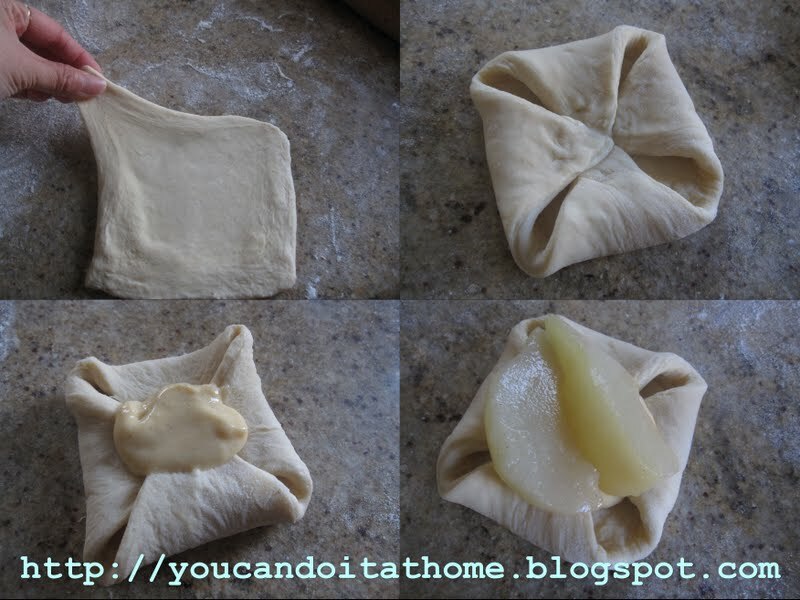 Cover the Danishes loosely with a damp tea towel and set aside in a warm place (24 – 26 c) for 1.5 -2hrs, or until almost doubled in size (note: the Danish needs to be fully-proofed. They will look wobbly and layers become highly visible when proofed). Spray the tea towel occasionally if it becomes dry. Remove the tea towel, brush the top of each Danish lightly with egg wash and place them in the oven. Reduce temp to 190c and bake for 15mins ( I like my pastry dark brown and it took me 20mins to fully bake), or until deep golden color. Cool slightly on trays before dusting with icing sugar and serving. Pour the milk into a saucepan and mix through half of the sugar. Bring the mixture to a simmering over low heat. In a separate bowl mixing egg yolks and the rest of sugar and whisk until mixed and smooth. Gradually add flour while still whisking, whisk until smooth and combined. Pour the warm milk to the egg yolk mixture and whisk well until smooth and combined. Return the mixture to a saucepan and bring to the boil, stirring continuously with a wooden spoon. Once the custard boils, reduce the heat and simmer for further 5 mins, stirring continuously. Remove from the heat, mix in vanilla extract, allow to cool, then transfer to airtight container. Place plastic wrap directly on the surface of the custard, cover with lid and refrigerate until ready to use. The creme patisserie can be made 3 days in advance. These danishes look absolutely wonderful !! @Ceren...yup, those are two I love too, as well as poached pears...I've been well....been busy, just came back from three week holiday, and didn't have the chances to put blog posts as often.